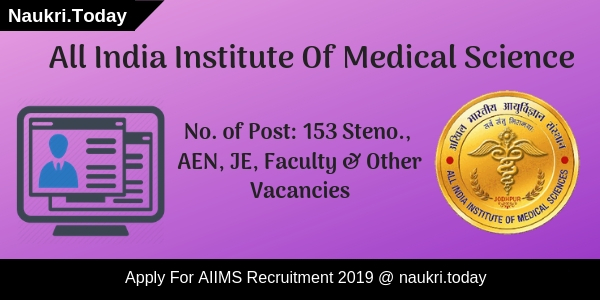 AIIMS Recruitment 2019 is available for recruiting candidates on 110 Stenographer, Medical Record Officer, Assistant Engineer, JE & Other Vacancies. The Online Registration will be started from 25 March 2019. Interested and eligible applicants may fill up their application form before the last date that is 23 April 2019. Minimum Qualification required for AIIMS Jodhpur Jobs will be started from 23 April 2019. Participants who belong to General & OBC category have to deposit Rs. 1000/-. as an application fee and SC/ST Category aspirants will pay Rs. 200/- for an examination fee. For further more details aspirants should read below article carefully. Fresh Update as on 10.04.2019: Candidates can apply for AIIMS Recruitment 2019 from here through the direct link as given below. The Department will be soon closing the online registration as on 23.04.2019 respectively. Education Qualifications AIIMS Vacancy 2019 Graduation and Engineering in Relevant Subject from a recognized university. Minim Experience required as per posts. 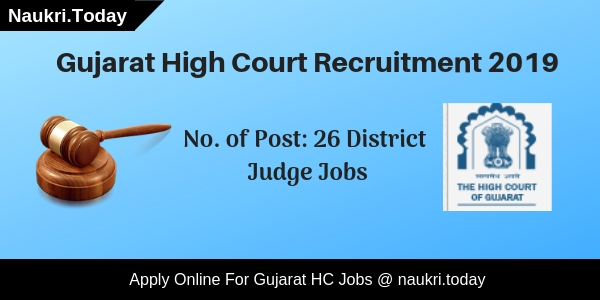 Candidates may refer to the official notification for further more details. What Is The Classification of Vacancies For AIIMS Vacancy 2019? What Is The Pay Scale For AIIMS Jodhpur Recruitment 2019? The Department will pay salary to as per 7th & 6th Pay commission to the selected. Candidates should check here Post Wise Pay scale form the given below table for AIIMs Jodhpur Jobs 2019. Conclusion: All India Institution of Medical Science had released notification for 110 Stenographer, AEN, JE, & Other Vacancies. Apply Online for AIIMs Jodhpur Recruitment 2019 before the last date. Are you waiting for AIIMS Recruitment 2019? If yes, All India Institution of Medical Science, Gorakhpur has published notification for recruiting candidates on 43 Faculty Vacancies. The Online Registration process is going to start from 07.03.2019. The Registration process is going to end on 06.04.2019. Candidates who have Medical Qualification and Post Graduation Degree should fill up an application form for AIIMS Gorakhpur Vacancy 2019. The Department will charge Rs. 3000/- as an application fee to the General/ OBC/ EWS category candidates. 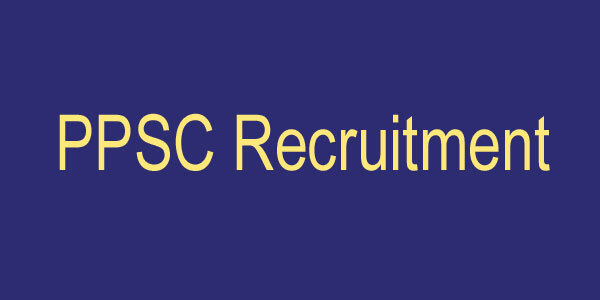 SC/ST/ Ex-Serviceman category candidates have to pay Rs. 1000/- for examination fee. Medical Qualifications, Post Graduation i.e. What Is The Mode Of Payment Of An Application Fee For AIIMS Vacancy 2019? Candidates can pay the application fee through online mode only. Candidates must check official notification for further more details regarding AIIMs Gorakhpur Bharti 2019. Candidates should log on to the official website of AIIMS that is aiimsjodhpur.edu.in/aiimsgorakhpur. After that search for the recruitment section at the Homepage. Read complete advt. notification carefully. Eligible applicants may apply online from here. Pay application fee via online mode. Keep a copy of an application form for feature use. Hello Friends, Do you want to apply for AIIMS Recruitment 2019? If yes then here is a good opportunity for you. All India Institute Of Medical Science is inviting applications for 41 Assistant Professor Vacancy. AIIMS Bhopal Jobs Notification has been published on 28.02.2019. Interested & Eligible applicants can attend the interview which is going to take place on 10.03.2019. Candidates who are having Medical Qualification, Post Graduation degree i.e. MD, MS are eligible to attend the interview. For more details, candidates must read the article carefully. Medical Qualification in Schedule I, II, III. Post Graduation degree i.e. MD, MS. Selection Process On the basis of Walk in Interview. Pay Scale For AIIMS Assistant Professor Vacancy Rs. 100000/- Per Month. Conclusion: AIIMS Recruitment 2019 notification is available for 41 Assistant Professor Post. Participants who are interested can download & attend interview for AIIMS Assistant Professor Vacancy 2019. Walk In Interview will be held on 10.03.2019. Dear Applicants, are you looking for AIIMS Recruitment 2019? If yes, then here is a great opportunity for you. All India Institute Of Medical Science has published a new advertisement for 231 Non-Faculty Post. Participants who are interested can fill application form from 01.02.2019. Ending date to submit the registration form for AIIMS Bhopal Vacancy is 15.02.2019. Applicants who are going to fill application form have to pay Rs.1000/- as registration fee. For more details, participants should read the given article carefully. Applicants who are going to fill application form can check eligibility criteria required for AIIMS Non-Faculty Recruitment 2019. For more details, participants can check AIIMS Vacancy Notification from the link given below. Education Qualification 10+2 with science & Diploma in Medical Lab Technology from recognized university. Yes, upper age relaxation scheme is applicable by the department. Relaxation will be given to Reserved Category candidates as per norms of Government. Yes, department is providing application fee concession to Reserved Category candidate. SC/ ST/ Ex-Servicemen/ Women participants are exempted from payment of application fee. Applicants, should logon to the Official Website of AIIMS Bhopal. Search for AIIMS Bhopal Non-Faculty Jobs Notification. Then there will be option available for downloading AIIMS Vacancy application form. Click on the link of application form & Download it or take print out of it. Fill all the personal details in AIIMS Bhopal Jobs Application Form. Make payment of fee through Demand Draft. Attach all the required documents (Self Attested) with application form. Then send hard copy of AIIMS Recruitment registration form on given address. Conclusion: All India Institute Of Medical Science is inviting applications for 231 Non-Faculty posts. Interested applicants can download & fill AIIMS Recruitment application forms from link given here. Last date to submit registration form is 15.02.2019. Are you waiting for AIIMS Recruitment 2019? If yes, there is good news for you. All India Institute Of Medical Science has disclosed 119 vacancies. AIIMS Jodhpur Vacancy is available for Store Keeper, JAO & Other Posts. Interested candidates should check here qualification, age, and furthermore information from here. Eligible participants can apply online for Clerk, JAO, Storekeeper Posts from 11.01.2019. Applicants have to fill up their application forms before 09.02.2019. For further details read below article carefully. Participants may fill up their form carefully otherwise their form will be rejected. Here we provided you complete details regarding qualification, age, and application fee for AIIMs Recruitment 2019. Candidates may download AIIMS Notification 2019 either from here or from the official website. Aspirants must have Degree of Graduation or Posts Graduation in relevant field for AIIMS Vacancy 2019. For more details regarding AIIMS Jodhpur Recruitment 2019 read official notification carefully. Here we provided links to download the Official AIIMS Recruitment 2019 notification. Applicants can check the age limit for the posts from the given below table. Here upper age relaxation scheme is also applicable for AIIMS Store Keeper Recruitment 2019. Candidates who apply for the AIIMS Jodhpur Recruitment have to pay an application fee through online mode. Aspirants of General and OBC category, application Fee for them is 1000/-. Applicants who belong to the reserved category SC/ ST/ Women/ PWD participants need to pay Rs.200/- as application fee. Selection of the candidate will be done on the basis of examination held by AIIMS Jodhpur Vacancy.Candidates who have passed the examination will get selected for AIIMS Recruitment 2019. For more information applicants must read AIIMS Jodhpur Vacancy 2019 Notitfication. Department will pay a great salary to the candidates who get selected for AIIMS Store Keeper Vacancy 2019. Here post wise salary details are given in below table. First of all, candidates who are applying for a job must visit the official website of AIIMS Recruitment. Applicants should read all the notifications regarding job carefully. Then click on “Click Here For Registration”. Fill all the entries correctly for the registration & click on”Submit”. Save the Registration Number & Password for future use. After completing the registration, login with Registered Number & Password. fill all the details in the online examination form & upload your recent passport size photo, signature. Make payment for AIIMS Recruitment application fee through online mode. Candidate must have their valid email and scanned copies of photo & signature. After that payment of examination fee should be done through online & then submit the form. Take print out of the examination form for future use. Conclusion: All India Institution of Medical Science has issued notification for 119 Store Keeper, JAO, Clerk & Other Vacancies. Participants should apply online for AIIMS Recruitment 2019 form links given here.